On Thursday, November 1st, Southeast Clean Energy Resource Teams (SE CERT) hosted a “Capturing Savings from Public Building Energy Efficiency: Benchmarking through Financing – Getting your Project Done” session at the Minnesota State University, Mankato’s Centennial Student Union. CERTs has worked for years to reinforce that the cheapest energy is the energy you don’t use. Turns out that the 50 attendees at the event know that’s true and were enthusiastic to hear from the range of speakers about varying strategies for reducing the impact of energy costs on their bottom line. Cheri Schneider of the Weidt Group kicked off the session with an introduction to the key elements of the Buildings, Benchmarks and Beyond—B3—Benchmarking Tool. Cheri highlighted the different ways that jurisdictions can use B3 to information to understand and prioritize which buildings are most in need of efficiency upgrades. The group discussion reinforced that measuring and tracking energy data is an essential first step to anything else. Data can be used to support the need for facility upgrades and improvements and can also be used to document the savings benefits. See Cheri’s presentation. Strategy 2: Get a Plan! Louis Schwartzkopf, Ph.D. Professor Emeritus of Physics and former Chair of the Environmental Committee at Minnesota State University, Mankato then presented on the Minnesota State Mankato Climate Action Plan. Lou walked the group through the process of forming an Environmental Committee to advise and promote sustainability activities, getting buy-in from leadership in 2013, and working with a graduate course research and establish a carbon baseline (they drew from this University of New Hampshire tool). Lou also emphasized the number of meetings they had with the campus community to gather input on sustainability actions. They have cut emissions by ~16% over 6 years. Energy projects have been the key part of meeting these targets as energy (largely electricity) was the primary component driving the baseline emissions. Beyond the energy work though, what was initially a Climate Action Plan has really become a more complete sustainability plan identifying a whole suite of potential actions. See Lou’s presentation. To better understand the energy and carbon savings Minnesota State University, Mankato (MSU,M) accomplished, Paul Corcoran, Assistant Vice President for Facilities Management walked the group through the major project that drove these savings. Paul described their $7.5 million Guaranteed Energy Savings Program (GESP) project that financed improvements across 2 million square feet of buildings. Paul stressed a few key points, highlighted below. See Paul’s presentation. A champion is critical to making a project happen. For MSU,M Ron Fields was the key champion who drove the project forward. Bundling projects allows an entity to aggregate the payback across short term and long term projects to get more projects done. They received a $500,000 rebate from Xcel Energy for the project that they can now put to other repairs. Lighting upgrades, in addition to saving energy save on the hassle of getting to hard to access lights and save on fluorescent light disposal costs. John Hutchens, Blue Earth-Nicollet-Faribault Cooperative Electric Association (BENCO) and Scott Kurtz, Xcel Energy both shared with participants that their utilities have resources and rebates to help their jurisdictions (among others!) move their projects forward. Each utility offers different types of rebates but both mentioned that LED lighting offers great payback. In response to an audience question about color temperatures and a study about the health impacts, John Hutchens referenced the American Medical Association study on LED street lighting from 2016. Both John and Scott said utilities are always happy to hear about your projects as soon as possible. 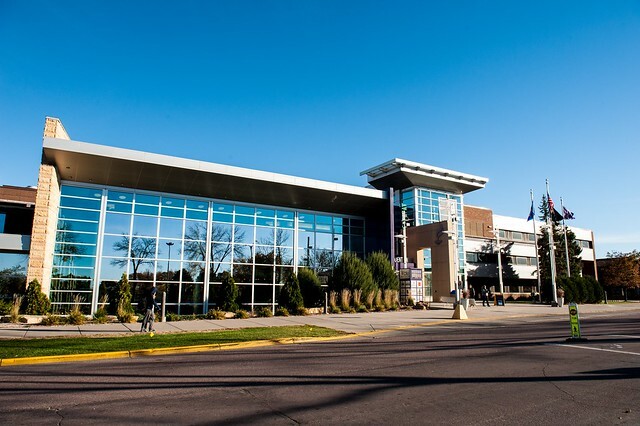 Read a case study about Mankato State’s efforts from Xcel Energy. Strategy 5: Harness the Capacity of Students to Work Toward Your Goals! Chris Meyer highlighted the way in which La Crescent, a Minnesota GreenStep City, harnessed assistance from a Winona State University intern to get started on its path to savings. Access the GreenStep intern guide to get started setting up your internship. Reach out to Chris Meyer for additional assistance. She’s already been identifying potential opportunities with interns from Winona State University, Minnesota State University Mankato, and Carleton. Strategy 6: Leverage Existing Programs and Resources! Peter Lindstrom and Peter Berger teamed up to describe the Local Energy Efficiency Program (LEEP). The best thing to do is read Peter Berger’s presentation. Pete described the process which starts with an initial walk through assessment, then a jurisdiction determines which buildings to move forward for a full investment grade audit. This audit can then serve as a road map to improvements moving forward—for a capital plan or to bite off improvements over time. Jurisdictions using LEEP can also access funding through the Energy Savings Program (ESP), an annual appropriation lease managed by the St. Paul Port Authority. Additional LEEP resources include the Minnesota Department of Commerce website and the CERTs website. Strategy 7: Learn from Others! After the formal portion of the gathering, participants had a chance to tour campus. The group visited the University Dining Center to check out their compost process. They have greatly reduced the amount of trash they haul, and the facility is so well run you really couldn’t even smell it. On the tour participants also got to check out outdoor efficient lighting upgrades and the new electric vehicle (EV) charging stations. Read a case study about Mankato State’s efforts from Xcel Energy. Many participants also joined speakers to get some one-on-one technical assistance and guidance on their own next steps. From B3 to LEEP, it sounds like there may be some other energy savings projects moving forward across southern Minnesota. Many thanks to all of our speakers!